Our design for the new Faculty of Social Sciences at Radboud University Nijmegen has been granted with the BREEAM Excellent design certificate. In line with the sustainability agenda of Radboud University, the design of the new faculty scores high in the various sustainability categories. In the meantime, the tender for the construction consortiums that are competing for the assignment for realization is also in process. 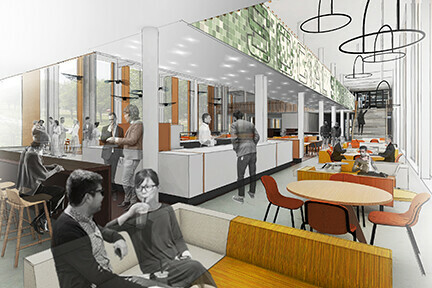 The new Social Sciences building will become sustainable, healthy and energy-neutral. The use of a lot of wood and plenty of space for meeting and relaxation give the building a warm atmosphere. The relaxed and precise integration in the landscape, the shape of the building and the construction of the façade, in which two floors are apparently merged by large white frames, make the scale human. Suitable for an institute that examines the behavior of people from a variety of perspectives and sciences. Before the construction can start, the current building on the Thomas van Aquinostraat has to be demolished. This is also done in a sustainable way. The contractor for the demolition, Beelen, was chosen because of the smart reuse of old materials. Virtually everything from the old building gets a second life: lampposts, bicycle brackets, furniture and waste bins come back to the grounds around the former Berchmanianum monastery, the future administrative building of Radboud University.